* Songs on Repeat ~ This music lover has two! When I first met you I was so impressed with your sense of style and ability to present a beautifully put together look. Where do you draw your style inspiration from? When I was really young I remember one of my favorite ways to express myself was through my clothes, as most kids do. They want to put outfits together! I always loved color and mixing and matching different patterns. From an early age my mom was really big on me taking art lessons which meant I painted a lot. I think most of the inspiration I get comes from my natural eye for it. The colors I like together and what patterns look good are important. But, I also think I always try to take a risk with something I wear. I'll often try on different accessories and random things until something pops in the outfit. Finding something that stands out even though it may or may not work is key. Ultimately, once I've found that item it's really about putting it on and feeling good about it. In terms of inspiration I never really look at magazines. I just go with what feels good. In dealing with an eating disorder, one of the parts of recovery is not subjecting yourself to things like the media. This further trained me to rely on myself and my instincts about how I feel in what I wear. I also think we can learn so much from kids and their way of putting things together because they're just happy in it. Sometimes it's really bright and sometimes it doesn't match, but for them it's about what feels good. They're wearing their favorite skirt or top or whatever it is because it's their favorite and it feels great. I think that's something that we miss a lot...finding something to really express ourselves. For me, I express myself through what I wear. So if I know I'm going to have a really bad day or things are going to be hard I'm very intentional about it. It helps me to wear a bright color or a piece that I love. Feeling good about what I'm wearing can make a huge difference in my day. What do you feel are the biggest factors that lead to eating disorders? I always use the saying that genetics loads the gun but environment pulls the trigger. This is something I'm constantly asking myself. Why do some people just have bad body image and diet forever and some people have an eating disorder. What makes someone cross that line? And I think truthfully a lot of it is genetics. If you have a history of addiction in your family it may not come out as alcohol or drugs. It may present itself through eating or overspending and shopping, and it may come out in a different way depending on your personality. I think that's the first part of it. Genetically some people are predisposed for it. Also, anyone that I have seen with an eating disorder started with some form of dieting. Or, they got sick with something like mono, and they lost a lot of weight. They may have even started going to the gym and lost a lot of weight. Many times there is some altering of their body that happened and they were also genetically predisposed. However, there's the aspect of family dynamics and how a person grew up as well. I think a family's view of body image does get passed down. If a child is seeing that their mom hates her body the child is going to develop a lot of those characteristics. Or, if there's chaos in the family, controlling your body is the first thing that feels reasonable and feels like something you can control when everything else feels out of control. Many eating disorder patients have anxiety or obsessive compulsive disorder, and how they eat is something they can control. A third possible situation is that there has been some sort of trauma. Some people have had a really rough childhood or they had a very bad experience and they hold that experience in their stomach. That's where we are the most sensitive which makes the idea of eating so difficult. Do you think there are ways to navigate raising daughters in a way that teaches them to love their bodies long term? That is the million dollar question right?! I think first its modeling to them what it looks like to love yourself. Mothers are the first examples of healthy body relationships internally and in regards to their children. It's very important to raise them to be confident while teaching them the simple skills of being assertive and how to use their voice rather than their body. Talking and giving them a space where they can talk about what's really going on is essential too. I think that eating disorders often develop as a means of saying something that they feel they can't say verbally. If it's modeled to them at an early age that they are worthwhile simply for who they are then their core sense of this will help them overcome the normal everyday hangups about their body. Do you feel like your personal experience with having an eating disorder makes it hard to hold yourself accountable when you are surrounded by it in your daily work? Honestly, no. I think that the final piece that truly helped me reach recovery was working with other people who were struggling with it. When I was in graduate school I was already in "recovery", but I wasn't fully recovered period. I feel like there's a difference. I was very resistent towards working with the eating disorder population because I felt like it was a cliche, and I didn't want any triggers. But, one of my practicums involved a person with an eating disorder and I felt like it was a good fit. I then started volunteering and doing some work on the side just to see how that felt. After that I did an internship at an eating disorder clinic, and that really pushed me into being completely recovered so much faster and farther because other women were looking at me as an example. Plus, I was hearing these messages every day, and I was helping challenge their cognitions. While I was working with them I was also doing the same for me and making myself stronger and stronger. The way that I look at it is that I think we've all been given fate and destiny. I think our fate is sometimes filled with all of these crummy things that happen to us that we can't control. They've been given to us specifically so that when we reach our goals of overcoming those things we find our destiny. A lot of people get stuck in their fate and never make it to their destiny. I feel grateful that one piece of my destiny is reaching this place of helping others. 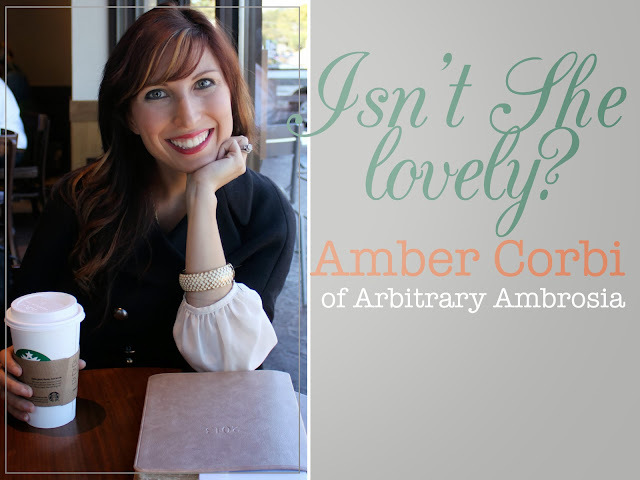 Amber's blog, Arbitrary Ambrosia, is a beautiful lifestyle blog where she really let's her style and creativity shine. It has been an outlet for her, and the community she has created with it is just another example of her loveliness. I always love her Music Monday posts and checking to see what great new ensemble she is wearing. I strongly encourage you to go check it out! Thanks again to Amber for letting me take a peak into her life and for letting us celebrate how lovely she is. Thanks for another great Isn't She Lovely post! Amber seems like a truly lovely lady! Love her advice of mothers being a goo example to their children. Loved this ISL feature! I love Amber as a blogger but I also enjoyed your connection with her so much. And I 100% agree with her about setting the example for how your daughters treat themselves. My mom has been on a diet of some kind for as long as I can remember. It was trigger for a lot of the image issues I dealt with growing up. I'm trying to set a good example for Ella by not only how we look in the mirror, but also how we eat and exercise. Its not easy! I agree. That was my favorite part. That and the phrase "genetics loads the gun and environment pulls the trigger". Hi Jana, lovely post and great to get to know amber. inspiring to see women helping other women. my college roommate was both anorexic and bulemic. she'd go into starvation mode or binging and purging modes. and I think like Amber pointed out, it's something that they 'can' control. Such important work to do.........wtg Amber on your recovery and your work. Sadly, I think women would be hard pressed to find someone who doesn't know at least one person effected by eating disorders. It truly is great that people like Amber give back and help others. Thanks so much for stopping by Pamela!